High Commissioner Navi Pillay addresses the Human Rights Council debate on Syria. Intense shelling and clashes between Government forces and supporting militias and anti-Government armed groups have reportedly resulted in hundreds of civilian deaths and injuries in and around Qusayr, a town near the Lebanese border. Hundreds of families are said to have fled the area over the last month as efforts to capture the town have intensified. The text, adopted by a vote of 36 in favour to 1 against (Venezuela) with 8 abstentions, also condemned the intervention of foreign combatants fighting on behalf of the Syrian regime in Qusayr, and voiced deep concern that their involvement poses a “serious threat” to regional stability. Addressing the Council prior to the adoption of the measure, UN High Commissioner for Human Rights Navi Pillay said that the situation in Syria reflects a “colossal failure” to protect civilians. Since March 2011, fighting between the Syrian Government and opposition forces seeking to oust President Bashar Al-Assad has killed more than 70,000 people, and left 6.8 million people in need. In addition, the UN estimates that some 1.5 million Syrians have fled their country to escape conflict. 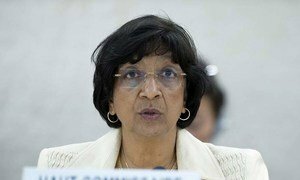 “The conflict in Syria is spinning out of control,” warned Ms. Pillay, who called for immediate action to stop further bloodshed and suffering. “The solution must be political. It will not be military,” she added. Speaking to reporters in New York, Secretary-General Ban Ki-moon said that “active talks” are under way regarding the proposed Geneva conference. However, there are still many decisions that need to be made, including agreement on a date for the meeting, as well as agreement among the opposition as to their representation. Regarding reports that the Lebanese group Hizbollah had stepped up its activities in Syria, he said that the UN is very much concerned that other actors have entered the fighting. He strongly urged all fighting to stop immediately so that a political process could begin. Mr. Ban said he had been urging all parties with influence – on both sides – to call for an end to the fighting. “Providing arms to either side will not help: there is no military solution [and] the only sustainable resolution will be through political means,” he said, adding that he had “taken note” of the European Union’s decision to lift its arms embargo in Syria. Mr. Ban also reiterated his call for a political solution in a message to the consultative meeting on Syria that was held today in Tehran. “Syria is disintegrating before our eyes. The chaos is creating fertile ground for radicalism and increasingly threatens regional stability,” he said in the message, which was delivered by the UN Resident Coordinator in Iran, Gary Lewis.